Kale is considered one of the healthiest vegetables of its kind and one way to be sure to enjoy the maximum nutrition and flavor from kale is to prepare it properly. 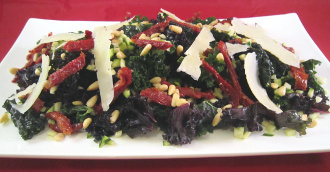 To preserve all the nutrients contained in kale, we prefer to consume it raw. See this article for more information about the amazing benefits of kale. It is very important to find the freshest kale you can. Look for leaves that are deeply coloured leaves and with hardy stems. Leaves could be any colour ranging from dark green, purple to deep red. If you prefer more tender leaves and milder kale flavour, choose bunches with smaller leaves. Remove the hard stem of the kale leaf. Rip each leaf into small (bite-size) pieces. In a large bowl, add the kale, olive oil, fresh lemon juice and a generous pinch of “Fleur de sel”, and massage the vinaigrette into the leaves for at least 1 minute. Set aside for 30 to 40 minutes. This process will break down the fibers of the kale making it less chewy. Cut the zucchini in a “brunoise” (cubes of 1/2 cm or 1/5 of an inch per side). Add 1 teaspoon of olive oil and 1/2 teaspoon of fresh lemon juice to the zucchini cubes. Toss and add a pinch of salt. Set aside. Cut the sun-dried tomatoes into match sticks. Set aside. Shave the Asiago cheese with a vegetable peeler. Set aside. Place the kale on a serving plate. Add the cubed zucchini, sun-dried tomatoes, pine nuts and Asiago cheese. 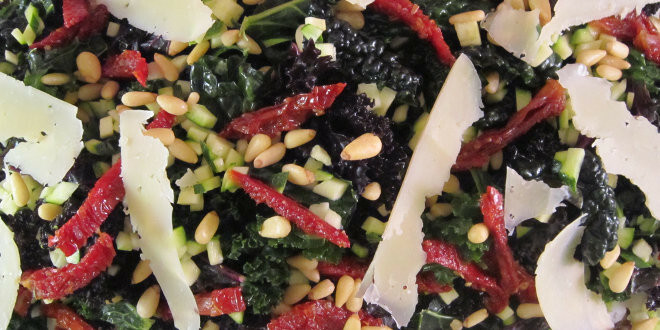 Drizzle the salad with 1 tablespoon of sun-dried tomato oil and serve. 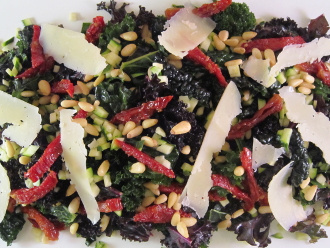 This version of kale salad is so good that you simply have to try it!